Hi All, I'm after some advice, I've been given a Jamis Dakota which after thorough cleaning and a new chain is in now in very good condition. I have done some research online to find out if the bike is if any value. I couldn't find much online therefore I thought I'd ask on here. I cannot comment on value but I bet the quality is pretty good. Try searching on 'George Joannou' and 'G Joannou Cycle Co'. Been around over 80 years and now is still family run and effectively selling in over 40 markets around the world. I know this because my part time (well, not this time of year) LBS job is at a Jamis dealership, family run local shop. I've built and serviced many of the Jamis bikes and have always been impressed with the quality of design and build. I'll bet yours is a fine rider so enjoy it. And go participate in a few threads right now, help us get to know you and get your post count to over 10 so you can post photos and more info. I'm looking forward to seeing your ride. Jamis is not very well known, but they are well made and spec'ed with decent components, so a good value. I've had Quest since 2011 and have been quite happy with it. Older mountain bikes, when equipped with smooth tread tires, make good commuter bikes, since they usually have eyelets for fenders and racks, and the geometry is a bit more upright. To start off, it's not a 1983 model. The presence of the chain stay mounted U-brake places it no earlier than 1987 and based on the Shimano Deore rear derailleur it is 1987-1988. The Shimano STX_RC crankset is a definite replacement. The serial number may allow us to determine the exact frame date and manufacturer. A Shimano Deore group was OEM spec for both both years. The frame material is listed simply as Tange CrMo. There's no mention of butting, so presumably it is plain gauge Tange #5 . MSRP was $529.95 or $595.00, depending on the year. As noted, ATBs generally don't hold their value well, especially the lower recognition marketing brands like Jamis. Plain gauge tubing and a chain stay mounted U-brake doesn't help. I agree that the prime appeal would probably be a commuter or recreational bicycle. I'd value it at $100-$125, ready to ride. Just another in a long line of late 1980s rigid frame MTBs. Around here, they are $50 to $100. I consider them a bargain in the recreational bicycle world. Sturdy, reliable, cheap. Thank you all for your advice, especially to T-Mar your knowledge is impressive, I thought I had stumbled across a valuable vintage but sadly not! I'd still appreciate the serial number for my database . TIA. The interesting thing about this bike is that it looks to have a fillet placed over the TIG welded frame tube joints. I believe a couple of companies did this in the late 80s on their mid-level bikes. Whether it's brass or some other filler material I don't know. Thank-you very much for taking the time to record the serial number. Unfortunately, it reveals nothing. I had hoped it would be one of the dozens of known formats, revealing the manufacturer and date. Instead, it looks like it may not even be a complete serial number. Thank-you for double checking. That resembles the format for Fairly of Taiwan, who was a contract builder for a number of brands around this time. However, assuming Fairly and given the age of the bicycle, it should be F8044905, which would make it April 1988. An insufficiently struck '8". could appear to be a '3' and if there is an actual gap between the 2nd and 3rd characters, as you typed it, it could be a missing '0'. FWIW, that's a handsome bike from my fave era for ATB's. I'd ride that in an NY second. 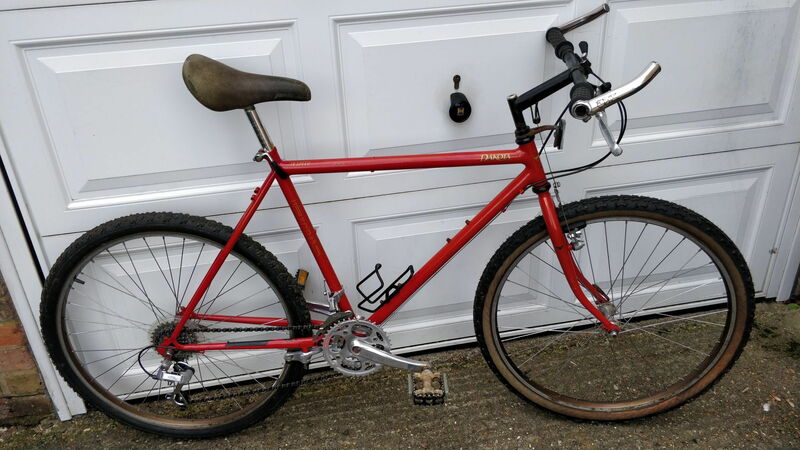 Late 80s/Early 90 Specialized Allez vs Sirrus - whats the difference?